Trichology and Hair Restoration Specialist with 20 years of experience in non surgical hair restoration in both men and women. RM: Tell me about some of your revolutionary procedures and how it’s changing the industry. How does this differentiate your practice from your peers? DS: Follicle Unit Extraction (FUE) has become the “gold standard” treatment over the traditional “strip method” because SmartGraft FUE transplant is minimally invasive, offers less pain, quicker recovery, with no scar formation as there are no incisions made in the skin. Using only local anesthetic, hair grafts are removed individually from the permanent hair-bearing scalp skin using innovative SmartGraft Technology. Facilitating very fast recovery, within 2 days all the micro-incisions are healed and there are no stitches to be removed. Most patients can go back to work the next day and can resume normal physical activities in just a few days. The answer to your question is summed up: No pain. No stitches. No scars. No downtime. 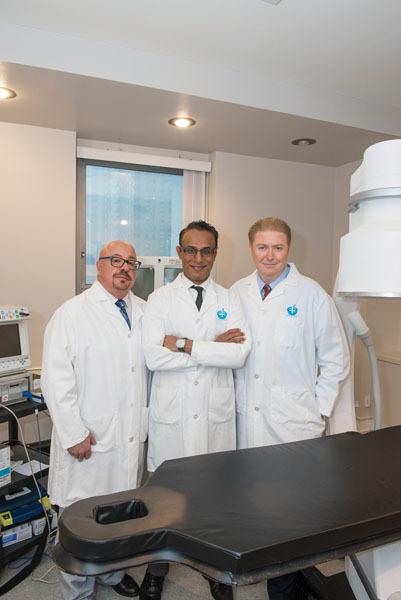 SG: Dr. Shusterman and I are co-founders of NYMD Hair Restoration Center of Excellence, as we partner with Joe Lore a tricologist who brings with him 20 years of experience in non-surgical hair restoration. NYMD Hair Restoration Center differs with other centers in that we look at your hair loss in a holistic manner. We use a multidisciplinary approach with a combination of treatment options to treat hair loss. We are able to offer the latest cutting edge technologies in regenerative, non-surgical and minimally invasive surgery hair restoration all in one location for one stop shop. We specialize in tailoring the right treatment for our patients. RM: Is follicular unit extraction technology new? What is special about SmartGraft? SG: No FUE technology has been around for many years. But, not all FUE procedures are the same! SmartGraft is the newest and most technologically advanced machine on the market. It offers the safest and most efficient way to perform a F.U.E. transplant. The SmartGraft technology harvests grafts more efficiently, using programmable suction. Using the device we gently remove, separate and count the grafts, and then store them in a temperature-controlled sterile solution. This method facilitates better hair follicle survival rates and healthier, more natural-looking results in our patients. DS: Other FUE companies have been on the market for over 10 years with almost no improvement in its technology. SmartGraft technology was recently released and is light years ahead of the completion. There are dozens of improvements with SmartGraft . This leads to higher rate of successful graft transplant and much better results. The follicle growth rate is over 95% with the new SmartGraft system. Now we can harvest grafts easier, faster and provide better outcomes. The SmartGraft procedure works for both men and women. It also works great on the eyebrows and facial hair as well. RM: What hair types are the best candidates for the SmartGraft procedure? DS: With SmartGraft was can treat all races, nationalities and patients with all hair colors and textures. If you have been turned down or told you were not a candidate in the past, you likely can now have this revolutionary treatment done at NYMD Hair Restoration Center of Excellence. RM: What are the main causes in men or women of hair loss or thinning? SG: It is important to understand that most of us lose 70-100 hairs from our scalps every day. This is a natural or normal process, where some hairs remain dormant, while some hair begins to grow new hair. As long as there is a balance the number of hair on scalp may remain constant and this does not need to be treated. We can determine that on our evaluation. Factors such as hormones, stress, medications, thyroid conditions, iron deficiency, surgeries, diets, skin conditions, childbirth can impair this balance leading to or worsening of hair loss. RM: Is there any medication that can treat hair loss? DS: Propecia, minoxadil and other medications can slow hair loss. We offer our patients a special topical mixture of several of the best medications in one formulation to apply to the scalp. This leads to much less side effects as the medication is not absorbed into your body and just absorbed and acts locally on your scalp. But even with treatment, eventually your hair will continue to fall out. The only permanent solution could be hair transplant. SG: The issues with medications by mouth or locally besides side effects, is that they must be used on a continual basis in order to sustain results and if discontinued, the problem of baldness, hairloss or thinning will resume. Come in for a free evaluation to see what treatment is right for you. RM: Who are the best candidates for this SmartGraft transplant procedure? DS: Due to the latest SmartGraft technology we can treat all hair colors and textures. All races including African-Americans can now be treated. We can restore hair in any area where more hair is wanted. Patients can restore or change the shape of their hairline. Scars in the scalp or face from prior plastic surgery or skin disease can now be treated. Eye brows and beards have also become popular areas to add natural and permanent hair. RM: How long does this procedure take? Does it need to be repeated? DS: This is a minor office procedure that can take up to 3-7 hours depending on the number of micro-grafts and size of area of baldness or hair loss. Usually most men require 2000 individual follicular grafts. Depending on the degree and size of baldness the patient may undergo 1-2 more procedures over the course of his lifetime. This is dependent on the degree of additional hair loss. RM: How is this procedure tolerated and what is the down time? SG: SmartGraft hair transplant is remarkably well tolerated. Within 24 hours small crusts will form and transplant donor and recipient sites will be barely noticeable. The transplanted hair will start to grow by 3 months and will continue to grow for life. The results is a full and natural-looking hairline with minimal downtime and no visible scars, unlike the older “Strip Method” hair transplants used at other centers. RM: If the follicle didn’t take to one part of the scalp, does that mean that area is blocked? DS: With the State of the Art SmartGraft technology we achieve a 95-98% successfully graft rate. The SmartGraft system makes the hair transplant process easier, quicker, less discomfort, and more successful—the viability of each graft is improved by the innovative “SmartHarvest” collection process that can be individually programmed to fit each patient’s needs. RM: What is PRP or plasma or regenerative therapy and how is it helpful for hair loss? SG: We have been performing Platelet Rich Plasma procedures, also known as “PRP” injections in muscle, tendon, joint, skin and hair. PRP has been used in medicine for over 20 years now. A small amount of blood is drawn from a patient and specially processed to separate its components to concentrate a pure PRP fluid. When PRP fluid is injected into the affected area it causes a mild inflammation that triggers the healing cascade. As the platelets organize in the clot they release a number of enzymes to promote healing and tissue responses including attracting stem cells and growth factors. As a result new cells begin to develop. In hair loss, this novel modality is based on promoting new blood vessel growth (also called angiogenesis), thereby opening new perspectives for PRP in hair restoration and tissue remodeling. PRP takes approximately 45 minutes and generally 2-3 treatments are advised. RM: Is PRP similar to the Vampire facial, but on your scalp? DS: Not exactly! In PRP injection of the scalp we inject in the dermal layer of skin to promote hair follicle growth, unlike the Vampire facial, which only injects PRP in the superficial layer of the facial skin. PRP has many positive effects in the body, besides skin and hair. PRP has been shown to mobilize your own stem cells for your body’s benefit. PRP injection is safe with minimal risk, short recovery time, natural looking results and only local anesthesia is needed. RM: Joe Lore, can you tell us about your background. JL: We have over 20 years of experience in hair restoration in both men and women. Over the years we have garnered accolades for a number of our technologies including being voted the top hair restoration center in the country by many networks in the fashion and beauty industry, most notably the No. 1 hair restoration center in the country by VSN network. Our expertise in field of Ultra-Sonic Hair Extensions led us to be chosen as a sponsor of the MTV movie and video awards. RM: What separates your extensions from those done at other centers? 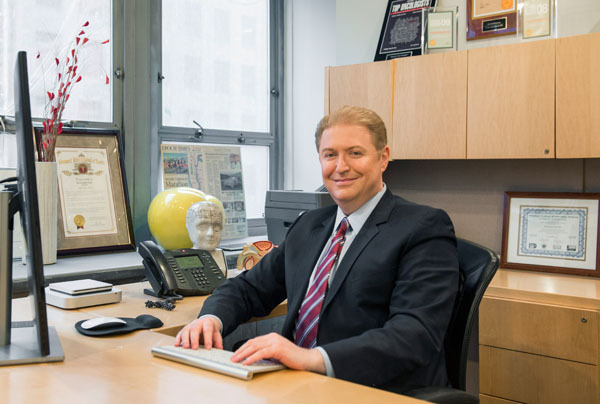 RM: What makes the Hair Restoration Center at NYMD a Center of Excellence? 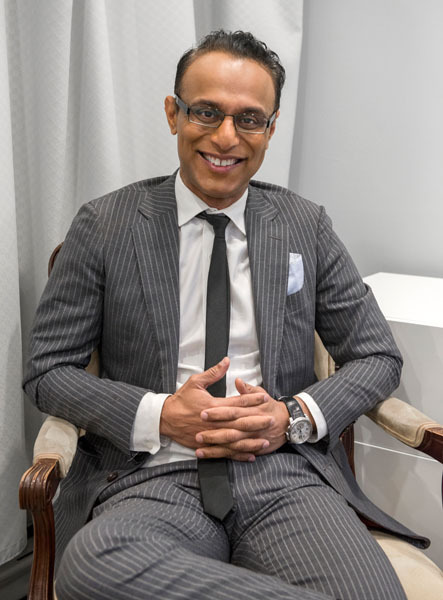 JL: We can treat all clients with any degree of hair loss, with both the latest surgical and non-surgical technology on the market all in one center. There is no other center like ours in New York! RM: What is cosmetic transdermal reconstruction (CTR)? Is it kind of like a wig? JL: Absolutely NOT. CRT is a human hair technology usually stays on for 4 weeks, while a wig you put on and take off your head on a daily basis sort of like a hat. It is transparent like a contact lens, thin, delicate and simulates the look of a transplant. We start with a blend of 8 polymers that’s truly transparent as the skin or base with which we use human hair purchased from Europe and India. We can control match the growth patterns, wave and density of hair that one may want and we can ensure a color match. What we create here imitates transplant but does not grow. Sometimes combining CTR with SmartGraft transplants can create an unbelievably realistic head of hair. RM: Does transdermal reconstruction (CTR) hurt? JL: No, not at all, because it is noninvasive, and does not involve surgery, there is no pain. It is a thin, delicate and life like, but to achieve a transplant like look, a new CTR skin needs to be applied on a monthly basis, which is attached with a medical adhesive directly onto your scalp. RM: What are your strengths? JL: My vision and passion to be a leader in a field of hair loss. I take great pride in the fact that I was one of the very first to specialize in Low-Level Laser Light Therapy (LLLT). LLLT can stop or slow down severe diffusion in about 4-16 weeks on average. 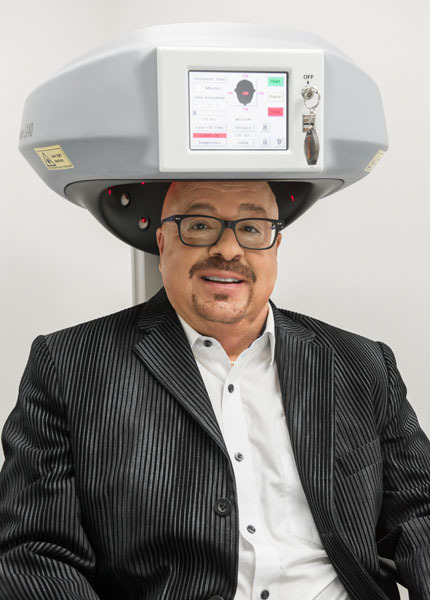 This state-of-the-art technology amazingly stops the progression of hair loss in 85% of patients that undergo treatment, while possibly promoting regrowth. Approximately 53% of patients can experience regrowth, when combining with PRP this percentage goes up even higher. Re-growing hair is not as easy as stopping hairloss, which is why we recommend LLLT and PRP. RM: How expensive is the procedure? JL: We have a multi-faceted customized approach to hairloss. The cost will depend on what the client chooses, included in the cost is a hair and scalp regimen combining with all natural Anagen growth products and supplements based on the recommended treatment and a sophisticated hair density analysis testing. RM: What advice would you give to patients? SmartGraft® is the newest innovation in hair restoration technology. This technology gives both men and women searching for a permanent solution to hair loss, the natural results to help you feel and look younger. Not only does SmartGraft provide amazing results, this treatment is minimally invasive with a quick recovery time. We all know hair loss is a common problem for both men and women. Half of all women will suffer with hair loss during their lives, and as many as 40% will experience female pattern hair loss (FPHL) by the age of 40. Women lose their hair for a variety of reasons, including genetic predisposition, stress, diet, hormone changes, and other lifestyle factors. Female hair loss is different from male pattern hair loss, yet just as impactful to one’s self-confidence. For women, over-all hair thinning is a frequent complaint as well as hair miniaturization or loss in the temple area, making it difficult to wear certain hairstyles, such as a simple ponytail or updo. A frequent complaint for women is loss of eyebrow hair, as well as a “ part-line” showing too much scalp. Sometimes hair loss occurs because of scarring, from surgery, accidents, chemotherapy or alopecia conditions. All of these conditions have the same potential for hair loss in men, compounded by even more frequently occurring male pattern baldness. In fact, by the age of 50, 85% of men have significantly thinning hair. With this latest technology available to you it is time to get “SMART” about hair loss and how it can be simply treated. Cynthia Rager, a partner in the company, joined Vision Medical, Inc., the makers of the SmartGraft Hair Transplantation Device, in 2013, when SmartGraft was in the research and development phase. Today, Cynthia continues to focus on company operations and innovation, putting her clinical training and plastic surgery clinic experience to use developing physician programs and products. For Vision Medical, it’s all about patient experience. As Cynthia mentioned, SmartGraft is the best technology available and Vision Medical provides support beyond compare to the physicians who use their equipment. But none of that matters if the patient experience isn’t positive, therefore Vision Medical focuses on patient experience. • First, will the treatment bring me the desired results? • How quickly can I return to normal activities after the transplant? • How long does the procedure take and will it be painful? Ms. Rager responded to those questions to give us further insight. Will SmartGraft Hair Transplantation provide the patient with the desired results? Following transplant surgery, how quickly can the patient return to their normal daily activities? How long does the hair transplant procedure take, and will it be painful? Roger Parkin, CEO of Vision Medical, and former owner of other medical surgical equipment companies, developed the concepts and worked with a team of design engineers to create the innovative technology of SmartGraft. During the research and development phase, he interviewed doctors performing hair transplantation, observing hair follicular unit extraction, and asking them how the process could be improved upon. He then worked with his engineering team to design the equipment with those improvements in mind. The SmartGraft FUE Clinical Advantage benefits both the physician and the patient. SmartGraft allows for efficient donor follicle harvesting. It is a closed harvesting system which means the hair grafts are extracted and stored at the same time and are kept cold and moist, increasing their viability. SmartGraft automates many of the required transplantation steps so treatment times are significantly reduced, which means the grafts will be transplanted quicker. It also reduces physician and patient fatigue. They no longer have to remain in one position for hours. The patient does not have to shave their entire head, which benefits patient privacy. Additionally, SmartGraft works with physicians who are employing exciting, innovative techniques fairly new to the industry, such as a totally “Shaveless Technique” and rapid punch harvesting. SmartGraft employs the newest extraction technology which means minimum penetration of the scalp and reduced probability of transecting the hair follicle. By using the principles of fluid dynamics and suction, the hair follicle is extracted in a clean and gentle manner, with less handling which reduces shock trauma to the follicle. In addition, SmartGraft utilizes specially designed punches, so the physician has choice and control of the best tool for each individual patient’s procedure. Another patient advantage of the SmartGraft FUE procedure is the lack of a linear scar. By using a tiny follicle punch, the site closes rapidly within 24 hours and can be completely undetectable within about a week. When the surrounding hair reaches a length of approximately 8mm, in approximately 14 days, the area is completely natural looking. If you are suffering from thinning hair or hair loss, consider what hair transplantation can do for you. Vision Medical’s SmartGraft technology makes permanent, natural looking hair rejuvenation a simple, in-office procedure with minimal discomfort and fast recovery time. Contact your SmartGraft physician today for a consultation and begin your journey to a youthful head of hair.